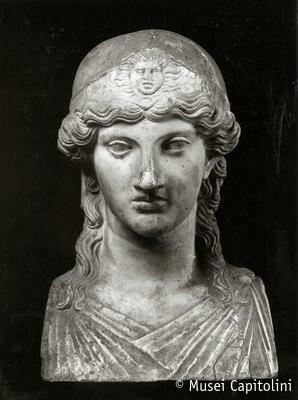 The herm features Athena; the goddess wears a close-fitting helmet decorated in the centre with a gorgoneion. The bust is clad with a thin chiton. The wavy hair, parted in the middle, is tied back on the neck with loose locks falling on the shoulders. The ideal face is characterized by slanting eyes and full lips. The sculpture, deriving from an original, presumably Attic, dating between the 5th and the 4th century BC, can be dated to the early imperial age. Formerly in the collection of cardinal Alessandro Albani, the sculpture was acquired for the Capitoline Museum in 1733; for a long period it was displayed in the Sala dei Filosofi, in 1926 was moved to the actual location.